This duplex apartment is located in Tribeca in Manhattan and the project was a master bathroom renovation for a young professional couple and their boy. 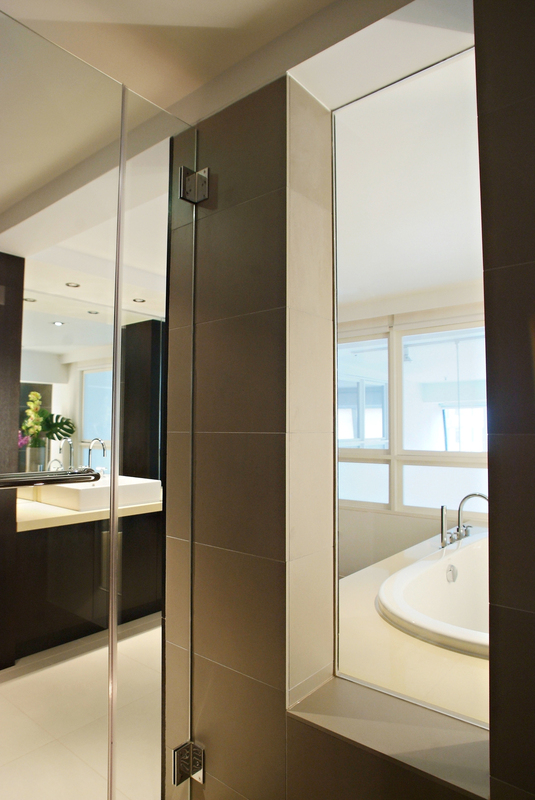 The focus was on creating a spa-like bathroom suite that provides serene comfort and understated luxury. The task was to reconfigure the preexisting layout into a grand vanity, deep soaking tub, toilet area and walk-in shower of generous proportions. The concept of hide and seek is introduced in the way that everyday bathroom clutter is controlled and a dividing wall that separates the shower from the toilet while still feeling the openness of the space. The bathroom is especially welcoming during colder months thanks to the warming radiant heat of ThermoSoft underneath the large leather texture beige porcelain floor tile. The space often doubles as a family room where the boy can keep the parents company during preparations in the mornings and evenings. Client requested a bathroom design that represents their way to a good life. Simplicity, genuine natural materials, practical detailing and sense of tranquility. Cute marble mosaic makes an inspiring wall finish. In the shower area, we have waterproof wall sconce to give the floor a little accent light. On the side wall we install ceiling cove lighting to create a soft and beautiful indirect lighting. To open up the living room space. We created this beautiful wood and glass sliding door opening that can be closed for privacy. We created this lounge study space for the client to enjoy. This place also doubles as guest room when needed. The sofa can be transformed into a queen sized bed. Live, work, play! We chose Safretti flueless fireplaces for their unique design and high-quality finish. It’s eco-friendly and burns with a special bio-ethanol fuel. We wanted a stylish and easy solution.